NOGLSTP has partnered with MentorNet® and the National Research Mentoring Network to offer its members opportunities to find a mentor and to be a mentor. Scroll down to read about both partnerships. Students: Get career advice from an LGBTQ+ engineer or scientist! LGBTQ+ STEM Professionals: Mentor the next generation of our community’s best and brightest science and technology candidates. If /when to come out in an interview? Should one de-gay one’s life at school or work? Should I join a student or Employee Resource Group or a professional association like NOGLSTP? 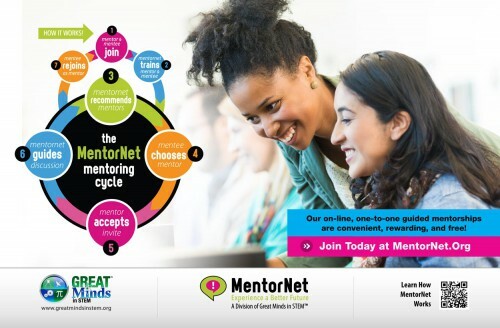 Follow this link to join MentorNet® now. It’s free and easy. Contact the NOGLSTP Mentoring Project Coordinator for more details about sponsoring this program. The National Research Mentoring Network (NRMN): for students and researchers in the biomedical, behavioral, clinical, and social sciences. Access FREE virtual mentorship, grantwriting coaching groups, mentorship training and more professional development programs and resources through the National Research Mentoring Network (NRMN), funded by the NIH. NRMN is a nationwide consortium of science professionals and institutions collaborating to provide students and scientists across all career stages of research in the biomedical, behavioral, clinical, and social sciences with enhanced networking, professional development, research resources and mentorship experiences. Download an NRMN flyer to share with your colleagues. Click Here to create your profile on the NRMN website today! You will be prompted to create a password and answer a set of basic questions to create your profile. When asked, “from which organization did you hear about NRMN?” please select NOGLSTP – National Organization of Gay and Lesbian Scientists and Technical Professionals from the dropdown menu. When you reach the end of the questions, you will be given the option of setting up your virtual mentoring profile. This will entail answering some additional questions, and so you may choose the option to log back in and complete this step later if you prefer. Once you’ve completed your registration, you will see a Confirmation page listing your responses. You must click the red button on the lower right-hand side of this page in order to finalize your registration.